The very last Special Hobby Newsletter for 2017 is here to bring our regular readers yet another model kit produced using the New Generation style of our steel moulds. And this type is the WW2 iconic P-40 Warhawk / Kittyhawk fighter. Now, we are going to offer you this model in two versions. We have also prepared several CMK resin sets for the P-40 family of models, some of which you will find in this instalment of Special Hobby Newsletter, while others will follow suit early in 2018. For our October new model, the 1/72 Biber sub, we have prepared a transport trailer kit. The RP-3, a British WW2 rocket projectile weapon was used on many an aircraft type during the war and did a great deal in contributing to the final victory of the Allied forces. And these come here in 1/32 scale as our another new styrene kit for the end of 2018. But, before we take a closer look at each of the new plastic kits and resin sets, let me express our sincere thanks to our commercial partners for their cooperation with Special Hobby in 2017. And I do believe for even better cooperation in the many years to come. And also many thanks to all of you modellers for your loyalty to our model products. The P-40 Warhawk/Kittyhawk formed the equipment of the USAAF units and other Allied air forces throughout the whole period of the Second World War. In many various verisons, the type saw service in all the theatres of operations. Because of that, the P40 fighter and fighter-bomber aeroplanes could be seen with markings of many air forces and wearing many colourful finishes. The P-40N version was the last one to be put into the service and fought mainly with USAAF units in the Pacific and in the CBI (China Burma India) theatre. While with the Commonwealth air forces, it was known as the Kittyhawk Mk.IV. The RAF deployed this version in Italy, the RAAF and RNZAF in the Pacific. One of the sprues which offers the smaller parts have also two styles of the propeller, one with narrow chord blades for the early P-40s, the other with broad blades for later verisons of the plane. This feature makes our P-40 kit the only one in production now to deal with the fact of the two different propellers. Amongst the smaller parts you can find also several other alternative parts such as for example two various exhaust stacks or two styles of the underbelly fuel tanks. The decal sheet caters for two US and one Dutch aircraft. The first of the American machines was embellished with a name on one side of the cowling and a nose art on the other side. It flew with the famous 49FG. The second machine of the USAAF saw operations in the CBI with the 80FG which was famous for having scary skull paintings on nose sections on many of their planes. The last option is a Dutch East Indies aircraft flying over New Guinea and bearing SNAFU acronym on its nose, flag-type national markings and a letter H on the tail. After the war, the plane kept on flying and our colour instructions depict this plane also as she appeared then in 1947. 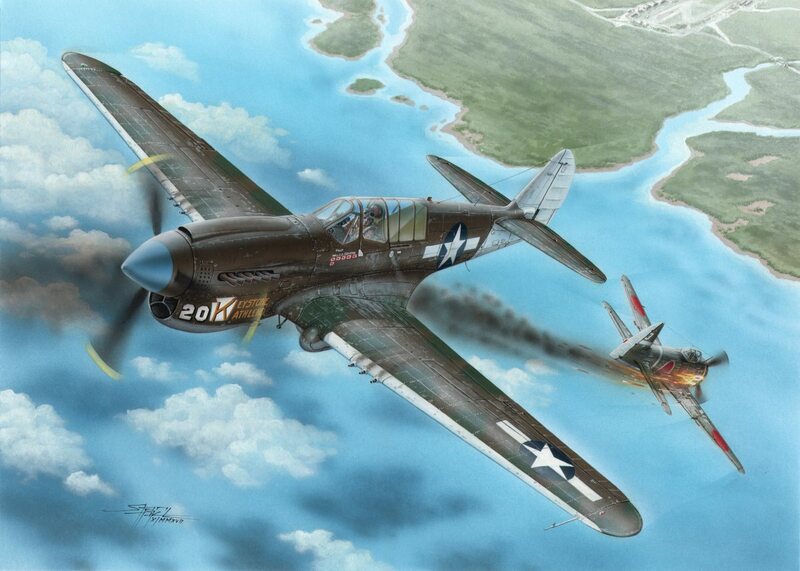 The P-40D/E Warhawk were the first verisons of the famous fighter aircraft to be equipped with a new Allison F engine. The D and E versions differed only very slightly in the armament, the D carried just four machine guns in the wing while the E had six of them. Besides the USAAF, the second biggest purchaser of the type was the British RAF which desperately needed any suitable type of a fighter aircraft. Because of rather unpleasant high altitude characteristics of the Allison engines which lacked the superchargers, it was not possible for the RAF to deploy the type in the skies of Europe, but put them in service over Africa instead and the P-40D/E became to be known as the Kittyhawk Mk.I and Mk.IA respectively. But the Kittyhawk flew not only with the RAF, it saw service also with other air forces of the Commonwealth, the RCAF put theirs against the Japanese forces over the Aleutian Islands while the Antipodes used their Kittyhawks in the Pacific, and yes, we must not forget that the Aussies also gallantly fought in their P-40s over the desert sands of Africa. The decal options bring you a machine of the famous 112sqn RAF which had an unmistakable shark mouth painted on the cowling and was named London Pride, the second option is an Australian machine named Orace which flew in the New Guinea area and the final option is a Canadian Kittyhawk of the No 111(F) Sqn RCAF. And further below in this Newsletter, we bring you several absolutely splendid 3D-designed resin sets for this family of the P-40 kits. One of the almost ‘miracle’ weapons that were to stop the victorious advance of the Allies, which they fortunately did not, was also the German Biber midget submarine (1/72 Special Navy new kit for this October). In 1944, when the mass production of the sub was commenced, also a new type of a road trailer was needed to haul the sub to the area of its combat deployment and a variety of heavy road tractors was used to tow the Biber on the trailer, as were the Hannomag SS-100, Faun or Kaeble. And when off road, half track vehicles such as the SdKfz.7 or SdKfz 8 were used too. The Biber Trailer model was 3D designed and is produced using machine-milled metal moulds. The Biber submarine is not contained in this kit. The British Rocket Projectile RP-3 was widely used during the Second World War on both the RAF and FAA war planes. Many various types were equipped with this weapon, which also could be fitted with different styles of war heads. The type of aircraft using the RP-3 ranged from the Typhoons, Hurricanes, Tempests and Mosquitoes to anti-shipping Beaufighters or anti-submarine Wildcat fighters and Sworfish biplanes. We are releasing now a kit of this weapon in the SAP or Semi Armour Piercing variety as a nice addition to already produced 1/32 warplane models. One styrene sprue contains as many as eight missiles and a corresponding number of racks of the later type and also a decal sheet with markings for the missiles. This set contains a detailed bomb bay for the new Airfix B-17G kit. The American B-17G was equipped with the excellent Norden bombsight. Not only this piece of equipment will you find in this highly detailed set of the bomb aimer’s nose compartment. The cast parts are tailored to fit the new Airfix model. This detailed set offers an open left hand side engine. It contains also the cover panels and a photo etched fret with the engine wiring. Special Hobby are going to release a completely new series of the American WW2 P-40 Warhawk/Kittyhawk fighter in 1/72 scale. Hand in hand with these kits, several new resin sets will also become available. Set no.7386 depicts the flying control surfaces which the modeller will be able to portray in deployed position. New resin cast landing flaps, ailerons, rudder and tailplanes with elevators can be found in this set. The later blocks of the P-40N fighters from Special Hobby, but also any other kit of this version will no doubt enhance their look by the addition of this new seat. No seat belts, 3D designed, master parts produced using a 3D printer. This upgrade contains a new pair of diamond tread tyres, the hubs come as separate parts and the set also offers a choice of both the hub itself and the hub with a cover. 3D designed, 3D printer-produced master parts. This upgrade contains a new pair of block tread tyres, the hubs come as separate parts and the set also offers a choice of both the hub itself and the hub with a cover. 3D designed, 3D printer-produced master parts.